Buy Before January 1st to Save Thousands. It’s December already, can you believe it? Where does a year go? 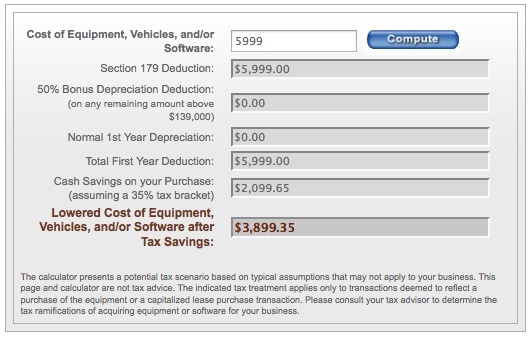 With the year coming to a close, you may hear a lot about “Section 179” and how you’re business can benefit if you are looking to purchase some equipment before 2013. We get just as confused as the next guy when you start talking “tax rate”, “deductions” and “depreciation”. We thought we would do a little research and try to explain how this could be a HUGE benefit to small businesses. When we say ‘equipment’, we mean any large purchase you buy to benefit your business. Some examples: a paint booth to help your productivity, a car lift to increase your repair business or a frame machine for the busy winter months. If your business needs it to increase business and it’s an ‘investment’, it is most likely included in this category. You can even finance it in 2013, but write it off in 2012 and save thousands. 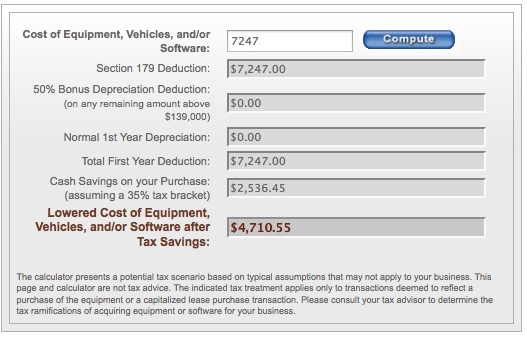 Several years ago, Section 179 was often referred to as the “SUV Tax Loophole” or the “Hummer Deduction” because many businesses have used this tax code to write-off the purchase of qualifying vehicles at the time. Today, Section 179 is one of the few incentives included in any of the recent Stimulus Bills that actually helps small businesses. In fact, if a business could write off the entire amount, they might add more equipment this year instead of waiting over the next few years. That’s the whole purpose behind Section 179 – to motivate the American economy (and your business) to move in a positive direction. How much Can Section 179 Really Save You? THOUSANDS! This is good on new and used equipment, as well as off-the-shelf software. This is the maximum amount that can be spent on equipment before the Section 179 Deduction available to your company begins to be reduced. This is taken after the $560k limit in capital equipment purchases is reached. Note: Bonus Depreciation is available for new equipment only. Bonus Depreciation can also be taken by businesses that will have net operating losses in 2012. With only 18 shipping days this month, you better order early to ensure you get yours! Get more information on Section 179 at http://www.section179.org/.